Published November 27, 2017 By Anna J. This post may contain affiliate links. Regardless, I only recommend sites I've researched and/or used and trust. If you’re like us, you wish you had the artistic skills to make anything that could be bought and sold on Etsy, the VC-backed, Brooklyn-based powerhouse that was valued in 2015 as a $3.5 billion dollar company. However, selling your handmade products on Etsy may not be the best idea – particularly if you cannot put an inhuman amount of labor into making your products (it is a market based on handmade items, after all. 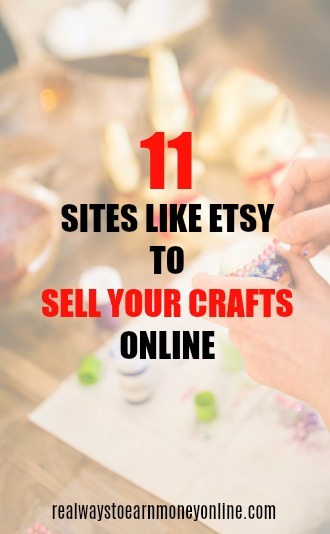 In order to make a real profit, you would need to make approximately 6 units per day) or be limited to only Etsy customers, or have 3.5% of your sales taken by Etsy – to name but a few of the platform’s issues – then you may want to look elsewhere for creating your online product empire. Don’t get your handknitted mittens in a bunch – we’ve compiled a list of favorite alternatives to Etsy that should be easy for you to sell your goods on! Read on. When you think of Artfire, you may think of it as one of the OG’s of artisan-supporting, web-based platforms – however, it was only started in 2011. Yet for some reason, the name seems cemented in our collective memory – this is likely because of their great marketing tactics, as the platform utilizes Facebook kiosk, Rapid Cart – even ArtFire coupon codes. Artists from all over the world can sell their homemade goods on ArtFire. From wedding dresses, to children’s toys, to jewelry (and everything in-between), this website has the smell of Etsy all over it – only there are different plans you can select, as opposed to Etsy’s stringent “three fee” rule. But keep in mind that the word on the street is that ArtFire is good for makers who can turn projects around – and fast, so it is a bit like Etsy in that respect. Zazzle is also similar to Etsy in that it is a top site to have your work displayed on; however, it is markedly different from Etsy, in that it is centered towards designers, who create a design, upload it, and see what items “go with” your design – like t-shirts, mugs, pens, linens, etc. Then, if your design sells, you make a profit. So really, folks are buying brand-new items from Zazzle that are print-based; handmade craft items, not so much. In this way, Zazzle is not a direct competitor to Etsy, and the money-making potential is really geared towards established designers. This handcraft marketplace is UK-based, and has three membership levels: a free version, which only allows for six product listings; a mid-level second tier; and a third level, which, for $50 per month, users can list up to 50 products (so, essentially $1 per product). Their website is cute if a bit basic, but hey – free is free. When UncommonGoods launched in 1999, its focus was housewares, which were either handmade or recycled. Its appeal is that it’s a “closed,” platform, meaning that you have to virtually pass a length submission process in order to sell on the site. And – get this – you have to give the suggested retail and wholesale price. Yep, you don’t need to adjust your screen – you can sell wholesale here. Buyers vote for your products, and you are then contacted for the next steps in being approved. See? It’s super tough to get in! But as buyers, it’s our new personal obsession – we love the geek-chic wares, and the website is lovely to look at. The best part about Zibbet is that its platform is directed towards providing tools for its sellers, like SEO, order management – even Etsy importing, so you can get the best of both worlds. Its website is similar to UncommonGoods, in layout and feel, i.e., it makes you want to buy all your holiday gifts on that website. Pricing-wise, there are no listing fees or commissions that the site takes. It has three pricing plans that are attractive to sellers, and even web-based help with your website and analytics. The best part is, it starts out at only $5 per month (or, $4 per month for an annual membership) for up to 50 items with four items per page. Not too shabby, if you ask us. 3DCart was voted the #1 Best Shopping Cart in 2017, beating out competitors like BigCommerce and Volusion. The e-commerce software has built-in templates for your store, making it easy to customize and set-up shop. It also has high-level security, amazing SEO optimization, comprehensive 24/7 support, and mobile/social features. That being said, because of its great features, it is, admittedly, a bit pricey with starting cost being at around $35.99 per month. Additionally, while it is “artisan-friendly,” it has become more geared towards food, factory-made clothing, supply chains, etc. In that respect, it is more much like Shopify than it may have originally set out to be. However, awards speak volumes, so it’s definitely worth looking into. The UK-based website is impressive, not only because of its very business-friendly attitude, but also because of little selling points, like its “Under £20” section, located at the bottom of the homepage. If you want to add-in your shop onto your blog or website, there is a “mini-shop” feature you can integrate as well. To garner web traffic, Coriandr runs ads and promotions constantly on their platform, so you are likely to see some views if you decide to sign up. The ArtYah website is pleasing to look at, and its brand is apparent from the start – its sellers primarily deal in handmade goods, antiques, and vintage items. You don’t need a membership to list your items, either; all you need to do is pay the $5 entry fee, and your shop is ready! The importance of this is that you can list your products for a very low price. Remember earlier, when we discussed how many units per day you would have to make to see a profit on Etsy? Well, in addition to making a high amount of units for Etsy, you would also have to price your items at around $20. While your goods may certainly be worth $20, you may have some items you’d like to sell that you don’t want to price that high. In this way, you can expand your retail empire! We wouldn’t be surprised if the BigCartel website was built on Squarespace – its simplicity, cleanliness, video integration, and crisp images all scream, “Squarespace” – and that’s a compliment! The homepage opens with the phrase, “We Believe in The Artist,” which immediately gets the visitor a sense of feeling like they’ve come home. It’s great conversion writing (i.e., it gets visitors to sign up! ), and has beautiful aesthetics. With all of the previous descriptors, you would think BigCartel wouldn’t offer free services – not so. Their Gold pricing is free for using, with a limit of five products, and it does lack the features of paid plans, like item pictures, custom domains, and discount codes, to name but a few; so, it is definitely worth signing up for a paid membership with the brand, if you decide to go that route. Another bonus is that BigCartel allows direct selling from your Facebook shop, which, again, is aiding in conversions; however, this time, those conversions are from social buyer to website buyer. A smart and cool e-commerce platform? We dig it. Cargoh is the type of platform that gives you the vibe that, if it were a living, breathing entity, it would say to you, “Okay, here I am – this is my website. Look at it.” That’s not a negative; Cargoh is like your tell-it-like-it-is BFF, and we’re here for it. Which makes sense, considering there are strict application rules (your items have to be “unique enough” – whatever that means! ), and Cargoh makes 10% off of every sale. The website is actually still in beta, but they are implementing new features all the time, and their community is completely devoted to the platform, so there are apparent upsides. They also have great customer service and fairly decent prices. Again, it’s worth checking out to see if it’s a good fit for you. If nothing else, you can test the waters and see if your goods are “unique enough” to get in! We love the “Trending Designs” section of Spoonflower – the website is absolutely adorable and clearly geared towards designers. Its uniqueness lies in the fact that it doesn’t sell on the sellers’ goods on their behalf, but rather, allows the design to be on all fabric products, from curtains to pillows to Christmas stockings. Think of it as the grown-up version of selling gift wrap door-to-door, only it doesn’t annoy other adults, and it’s all online. What’s interesting about all of these websites is that they are unique to the seller, whether you are a designer, artisan, or hobbyist. Choosing the best platform for you to sell on is entirely up to the individual. Let us know if you find any seller-specific platforms you love for selling your crafts online, why they work best for you, and how they have helped you launch your online e-commerce store for your handmade designs and/or products! In the meantime, we’ll admire you crafty folks from afar. Interested in another way to earn a living selling stuff online? I have recently noticed Amazon launched a handmade category. Have you heard anything about this? I read one of your articles on places to sell online – thank you- yours was so much more informative than others articles (and I’ve read them all..lol). I liked “Muabs” premise of selling just makeup, but have you found any sites, like that, that just sell jewelry? How about Spiritual items? Im sooooo over Ebay, and looking for other nitches to sell things on. Thanks for putting this list together! I know a lot of crafty ladies who would love to read this. And you know I’m passing this along!